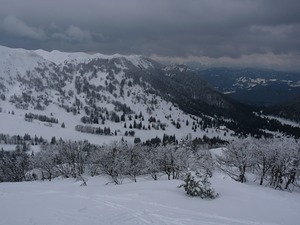 Soriska Planina (Soriška Planina) is a small resort with 6km of slopes that offer good tree-skiing and riding to better skiers and boarders, when the snow is deep enough. 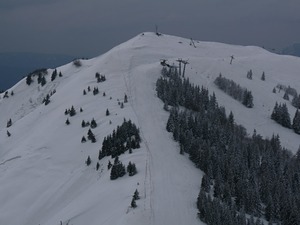 The Soriska Planina Ski Centre (Soriška planina Ski Centre) is located on the upper part of Mount Selška planina, above the village of Sorica. SKI RESORT IS OPEN! WELLCOME! We visited Soriska Planina on the first Sunday in March 2014 at the tail of the Slovenian School holidays. 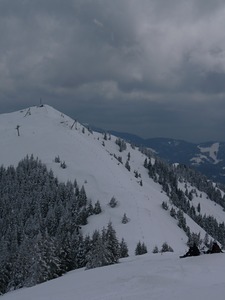 The idea was to avoid inevitable weekend crowds at Vogel and to go somewhere a bit less exposed to the unsettled weather. As reported, the resort was very quiet/low key and although some lifts were closed (notably the chair) this did not really affect access and there were no queues. Although I am only interested in backcountry snowboarding I could see that the ski area would be a good place for learners to gain confidence as long as they are already able to ride button lifts. 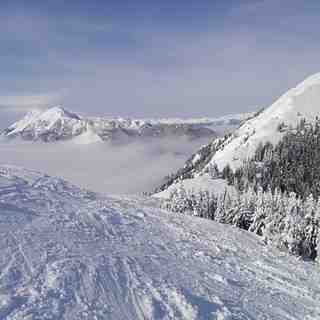 Off-piste, I fully agree with the other reviewer who wrote that there is more than you would guess from the resort map. There are some nice short wooded strips within the lift-accessed area but these are quickly tracked out. The real interest is out wide of the ski area, away from the lifts. To access this, from the summit ridge, ski down the ridge in either direction and then hike up to adjacent summits. It's easy going, takes about 20 minutes as long as someone else has already cut a track. The views are excellent. Dropping off either summit and back into the resort basin you access some very nice off-piste that is up to about 45 degrees and quite featured. It's extensive in relation to skier traffic, so would not be tracked out too quickly. The forest density is very variable and some routes down are wide treeless glades whereas others are steep and heavily forested and very challenging. 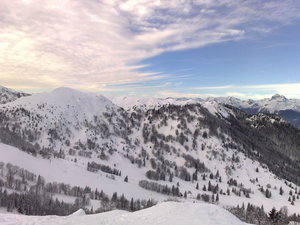 All in all, a very worthwhile alternative to Vogel, especially when the top of Vogel is foggy and/or windy. 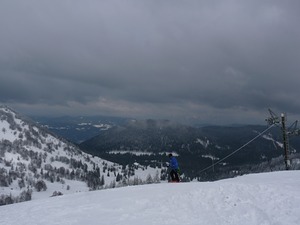 Fairly low altitude at Soriska Planina, so beware of heavy and sticky snow conditions in mild weather. There are three pretty basic places to get a snack and a drink, and like the lift passes, prices were very reasonable.